Acidic wheel and rim cleaner. A liquid, acidic, foaming, pre-spray agent, which removes deposits such as brake dust, dispersed rust particles, calcium etc. from all acid-resistant materials. Cement truck and Construction equipment cleaning where it is useful and effective in removing 'cement-film' found on trucks, mixers and other equipment. Industrial cleaning where calcium deposits or rusty powder stains are found on metal. Economical to use because it is applied with a Pre-Spray tank, and because it is effective in low concentrations. Cleaning of steel and light alloy wheel rims. 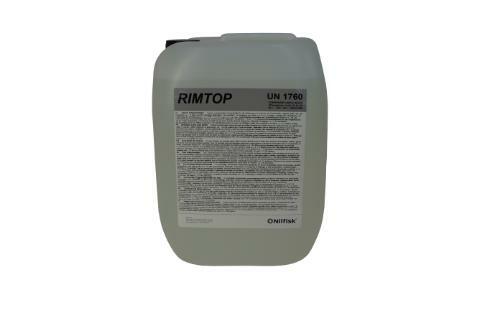 Pre-spraying application: Dilute RimTop between 1:10 (10%) and 1:5 (20%) in the pre-spray device, and apply to dry wheels, if possible. Allow the solution to work for a short time (but do not let it dry), and wash it off with a high pressure washer. Hand Cleaning methods: Dilute RimTop to a 1:5 (20%) solution and apply with a brush or soft sponge. Protect the user's hands and skin from direct contact.